OK, so this isn't really cooking, but what it does do is give you the opportunity to have a bit of fun, with a tasty end result that makes a nice little treat at a dinner party or a cheesecake decoration. It's quite straight forward and great to get the kids involved, my only rule is you don't stop them dipping their finger in some melted chocolate - its the law (unless it's hot, obvs). I’ve given my favourite toppings here, but use whatever decorations you can get your hands on. First, boil two pans of water. Once boiling, pop your milk chocolate into 1 bowl, and your white chocolate into the other, and carefully place over both pans. Reduce the heat, and slowly melt your chocolate, stirring every so often. While your chocolate melts, take an oven dish and line it with cling film. A smallish one is best for this amount of chocolate. If you go big, make sure you increase your chocolate. Once melted, take the bowl from the pan and place onto tea towels. Carefully pour your chocolate into the oven dish, it’s best to pour all of it in and then slowly spread it around the bowl. If it doesn’t go to the corners, that’s fine. Once you’ve got an even layer on the bottom, pop into the fridge for around 5 minutes, or until you notice it is starting to set but still a little melted. Remove the dish from the fridge, and now the fun begins! Sprinkle over your raspberry sweets, chocolate curls, ginger biscuit and whatever else you fancy! Lastly, take your white chocolate (which should still be melted but a little thicker which I find a bit easier to use) and use a tea spoon to drizzle your chocolate all over. Don’t be scared to splash, drip, drizzle and get messy – be creative. Once you’re done, pop back into the fridge to harden again. 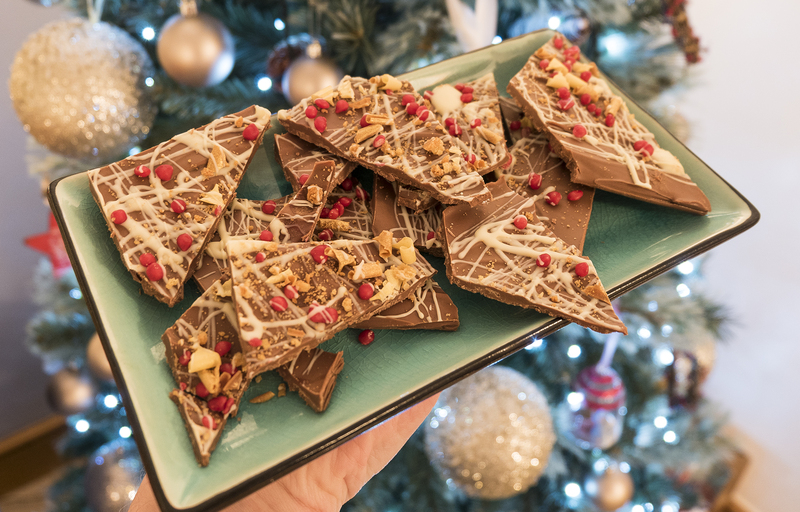 When you’re ready, break up the chocolate into shards, and place in the middle of the table, or just enjoy with a cider and a film.